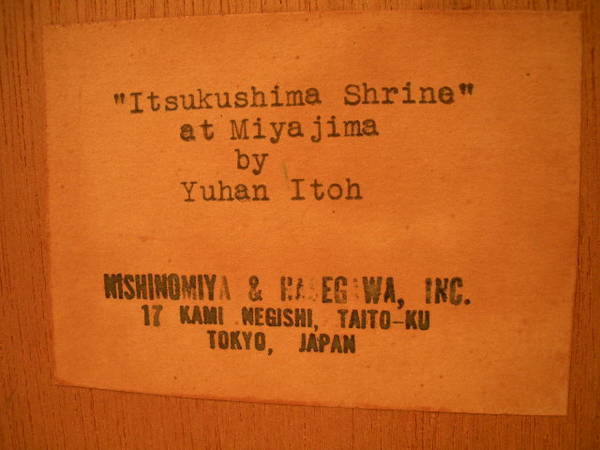 [Go Back] [New Search] Details for Ito Yuhan (1867-1942 Yoshihiko, Yasuhiko) "Itsukushima Shrine at Miyajima"
Notes (1st edition)? 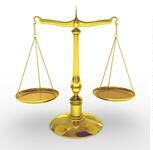 : English title taken from a publisher label. "Ito Yuhan (1882-1951) was a landscape artist who designed several woodblock prints during the 1930's. 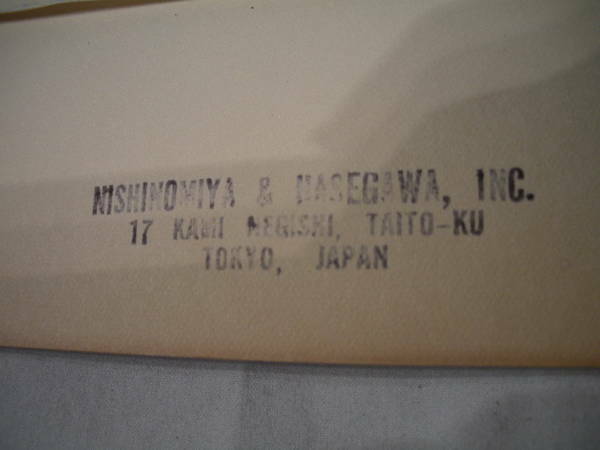 His work was published by Nishinomiya Yosaku. 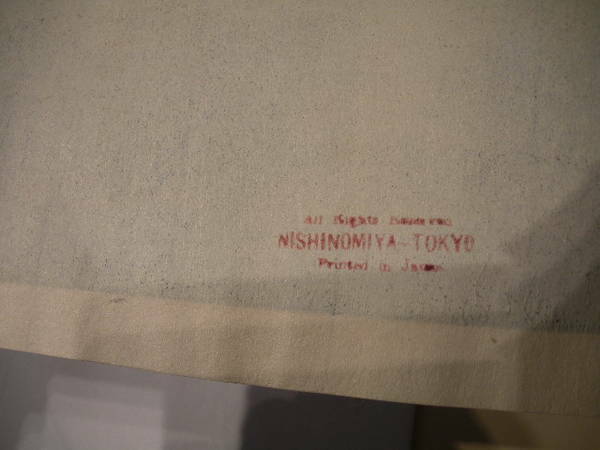 He is best known for designing several views of Miyajima printed in blue tones. His prints are characterized by vivid colors and subtle gradations". The subject here is a night view of "ITSUKUSHIMA SHRINE at MIYAJIMA". In the background you can see a gate in the water. The waning night view (Blue sky above) shows the full moon, and two lanterns that reflect, boldly, in the deep blue water. The artist's Japanese character mark is in the lower right corner. Additional character marks on the left side, behind the matt. There are some more characters on the back of matting (see photo #14). 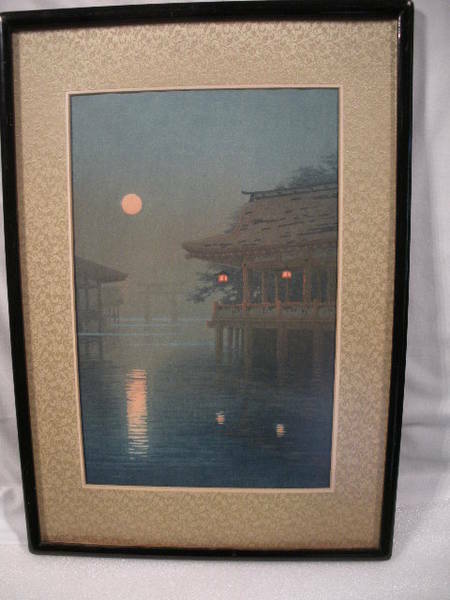 The sticker on the back of mahogany wood backing reads "ITSUKUSHIMA SHRINE at MIYAJIMA by YUHAN ITOH .. NISHINOMIYA & HASEGAWA, INC. 17 KAMI NEGISHI, TAITO-KU, TOKYO, JAPAN". 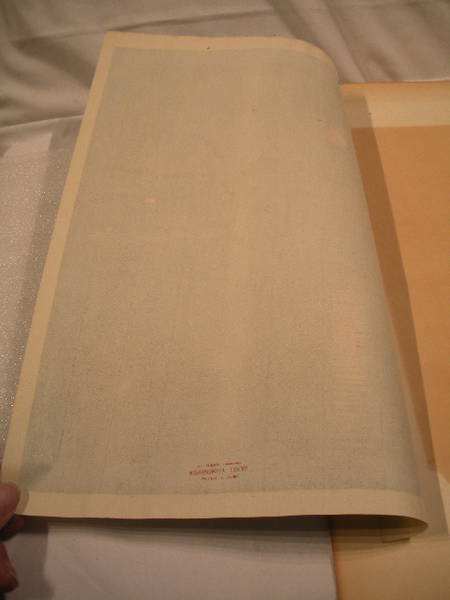 The printer information is similarly shown on the bottom and back of print; behind the matt. The print is matted with silk fabric. It is a subtle green/gold color with woven floral design. The print is framed in black lacquer wood, with non-glare glass. The back of print shows bleed-through. The print is glued lightly, only on left side. The actual picture measures 9" x 14". Framed, it measures 14" x 20". If buyer chooses to receive the print without the frame and glass, we can do that, but it will be shipped flat. Condition is Excellent! No fading, tears, or any other damage, including the matting. 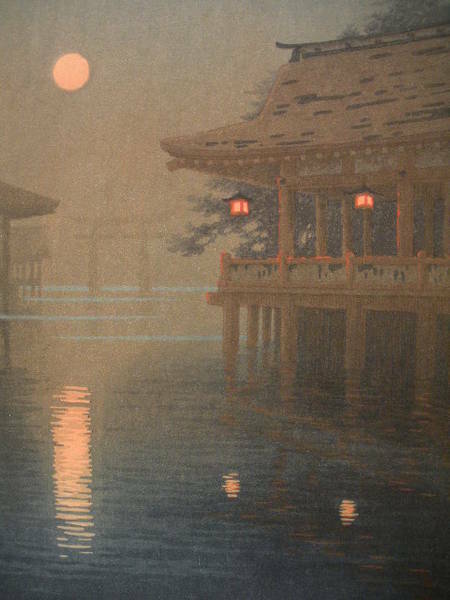 Artist Bio: Y. Ito or Ito Yoshihiku lived from 1867-1942. He studied first under Tamura Soritsu in Kyoto, graduated in 1888 from Kyoto Prefecture School of Painting and went to Tokyo to study under Koyama Shotaro briefly before entering Harada Naojiro's school, the Shobikan. Ito Yuhan's painting style is always recognizable from across the room. He signed his watercolour paintings Y. ITO. He was a very successful landscape painter as well as a woodblock print artist. He created 12 woodblock images that were published by Nishinomiya Yosaku from the 1950's (not pre-war, according to the publisher Nishinomiya), signing them YUHAN. This painting is well done in a 'Western' painting style that started in the late 1880s when Japan opened its' doors to the West and its' teachers. 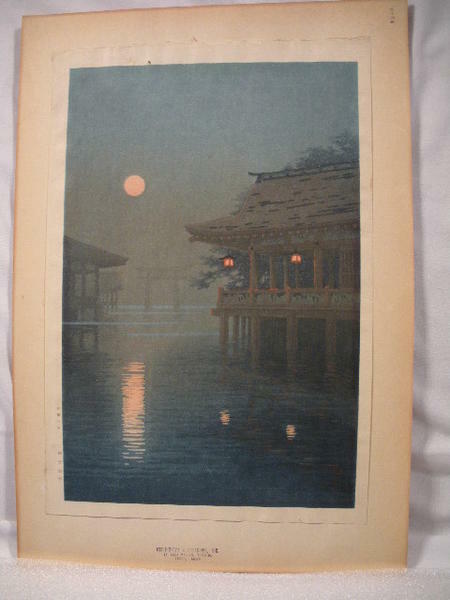 The popularity of this style grew into the 'shin hanga' woodblock print movement at the beginning of the 20th century. 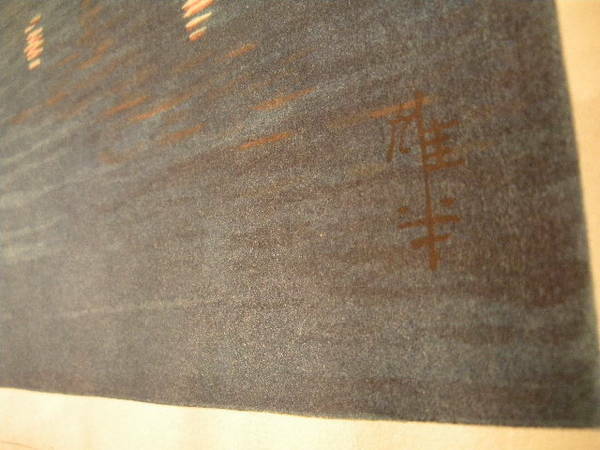 His woodblock prints have either his signature in Western script ""Y Ito"" or in kanji. 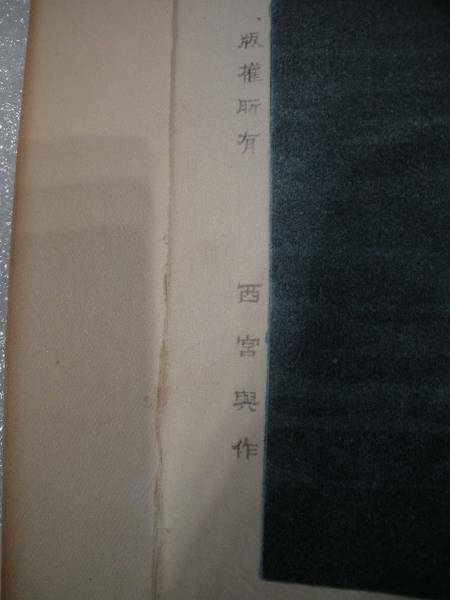 Those in Western script are the earlier (pre-war) editions.